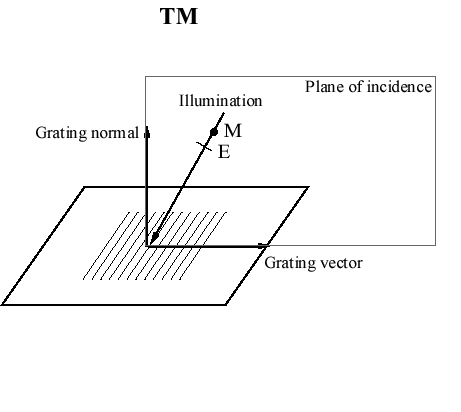 The polarization of light incident upon a grating is defined by the orientation of its electric and magnetic fields relative to the plane of incidence, where the plane of incidence is defined by the two vectors being the propagation vector of the illumination and the grating normal. 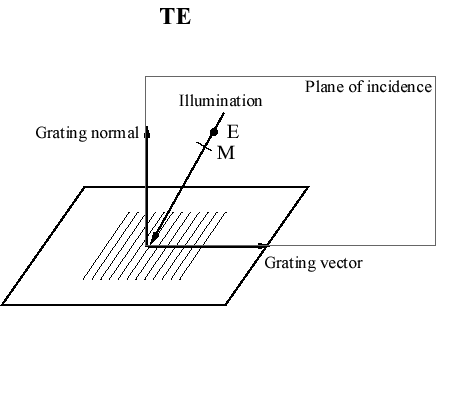 TE (Transverse Electric) polarized light is characterized by its electric field being perpendicular to the plane of incidence. For TE light, the magnetic field – always perpendicular to the electric field in isotropic materials – thus lies in the plane of incidence. TM (Transverse Magnetic) polarized light is characterized by its magnetic field being perpendicular to the plane of incidence. For TM light, the electric field – always perpendicular to the magnetic field in isotropic materials – thus lies in the plane of incidence. For the purpose of defining the diffraction efficiency of a grating, unpolarized light is equivalent to the average of TE and TM efficiency.